This topic contains 0 replies, has 1 voice, and was last updated by support-tony 1 year ago. If your access to the Internet needs to go through a proxy server then eclipse needs to know about this in order to perform network related tasks. These tasks include installing or updating plugins and using tools that automatically download files from the Internet (such as maven and the Angular tooling). This information is only applicable if you need to access the Internet through a proxy. 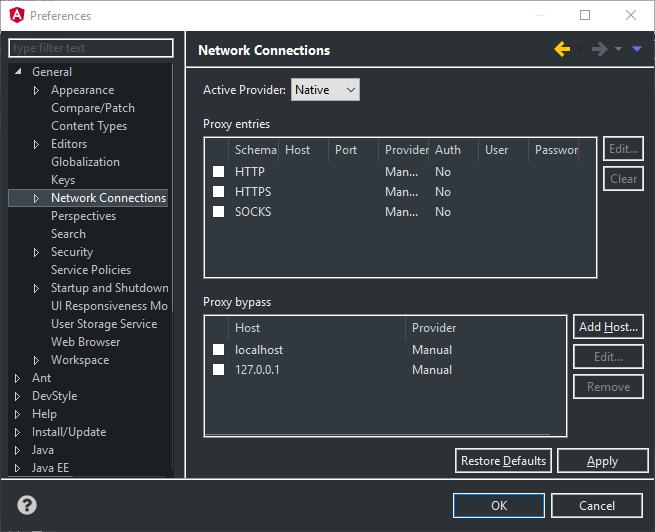 For setups that have the proxy settings configured in the system (for example, in Windows via the Proxy page of system settings), then all that is needed is to set the Active Provider to “Native”, as shown in the following screenshot. In this case, no other settings are needed. 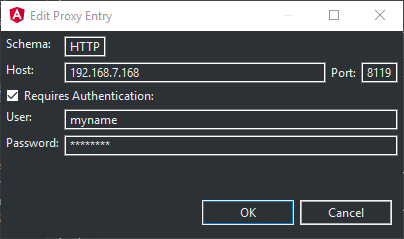 If you don’t have a system proxy set but still need to go through a proxy, then set the Active provider to “Manual” and configure the appropriate schema in the “Proxy entries” section, as shown below. Note that the name and password are only needed if you select the “Requires Authentication” option. In this case, see the note below. If you have unneeded schema configured, select that schema line and click the “Clear” button. In some environments, certain authentication schemes may be undesirable when proxying HTTPS. Accordingly, the Basic authentication scheme has been deactivated, by default, in the Oracle Java Runtime, by adding Basic to the jdk.http.auth.tunneling.disabledSchemes networking property. Now, proxies requiring Basic authentication when setting up a tunnel for HTTPS will no longer succeed by default. If required, this authentication scheme can be reactivated by removing Basic from the jdk.http.auth.tunneling.disabledSchemes networking property, or by setting a system property of the same name to “” ( empty ) on the command line. Additionally, the jdk.http.auth.tunneling.disabledSchemes and jdk.http.auth.proxying.disabledSchemes networking properties, and system properties of the same name, can be used to disable other authentication schemes that may be active when setting up a tunnel for HTTPS, or proxying plain HTTP, respectively.